Yesterday was glorious; the weather held beautifully; sunny, cool, clear, perfect for walking. The Ocean Trail is level walking on a gravel surface mostly - easy going and unbelievable views. We walked that when we were here in 2005, but this time we went across the sand beach and onto the Great Head Trail. Some climbing, fabulous, cool, silent woods, and always the ocean crashing and murmuring. Pix are on smugmug. 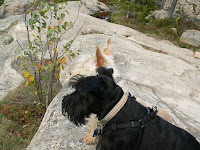 Scotties are absolutely pooped today -- two days of walking more than 5 hours each day left them a little tuckered out -- not to mention the humans.